I’ve always been a bit of a pedant, and in that spirit, I would like to write about some use of terminology in interaction design that has been bugging me: affordance. If you’re familiar with the field, the lengthy debates around what the word exactly means may be an old hat to you. Here’s some quick background if you aren’t. Affordance is a term coined by psychologist James J. Gibson in 1977 to denote the actions an object or environment allows a person to perform. For example, some of a stick’s affordances are touching, picking up and poking someone with. The word is simply a derivative of the verb “afford”. In his popular (and great!) book The Design of Everyday Things (originally published as The Psychology of Everyday Things), Donald Norman reinterpreted the term to mean those actions which a person can readily perceive to be possible, i.e., those the environment suggests or invites you to perform. Norman’s affordances are a thus a special subset of Gibson’s affordances. They also become something that’s desirable in the design of interfaces; if a button doesn’t look like it can be pressed, the user probably won’t press it. Norman later realised the discrepancy and has been trying to re-educate the world, who love using his earlier interpretation of the term, but to little avail. Most people nowadays still use affordances to refer to those interactions which are apparent. It is debatable whether this is a problem. Although Gibson’s meaning is the only logical one, people jumped on Norman’s use for a reason: the meaning he introduced is a very useful concept that needed a name. One could argue that a new word should be invented to signify perceived affordances, but that’s not a very realistic undertaking, since even Norman himself has failed to change people’s minds. What all the discussions about this terminology seem to overlook, however, is that in adopting Norman’s meaning of the noun, people have also re-applied it back to the verb Gibson’s original term was based on. To afford no longer means “to allow”, but “to suggest” or “to advertise”! I get the impression that people of any particular discipline somehow love having terms that only they understand. ... they would look exactly how they do now. When colour labels made a return in Mac OS X 10.3 Panther after years of waiting, it was a bit of a letdown. For most, this was because they were functionally the same as what the Classic Finder used to offer. Personally, however, I don't really need more than 7 colours, and the colours are distinct enough, so I don't really feel the need to customise them either. Somehow this look immediately made me think of Windows XP, with its overpoweringly saturated, bevelled window frames and buttons. It just didn't look like Apple. But even leaving taste aside, it simply doesn't work very well. The colours are so strong and dark that it becomes harder to read the actual names of the folders. And why those gradients? They just add more clutter. To allow you to quickly spot all the files of a particular colour, whose meaning you have memorised, e.g., "All archived stuff is grey." To bring certain files to your attention that you have previously marked with that intention, e.g., "I must review this document, so I'll make it red to remind myself later." So applying the principle of the smallest effective difference for Finder labels would mean finding a set of colours that fulfil these two purposes when set against the white background of a window. It's a real shame how simple, proven design principles like this are ignored for the sake of eye candy (and not very good eye candy in this case). I think what we need is an option in the system preferences to switch from "Shop Demonstration Mode" to "Work Mode". Following a couple of years of contemplation, John Gruber of Daring Fireball has finally made writing his full-time job. John is a great writer, and DF is my favourite Mac/technology column. His analyses are always spot-on, making it seem like he has been blessed with an unfairly large share of all the common sense in the industry. Also, through his Linked List he acts as a sort of human news aggregator/filter, saving me from having to read through all those other blogs and news sites myself. If you make an appropriate donation, you will be rewarded with goodies such as full-text RSS feeds and cool t-shirts. I really hope this works out for him. I've just discovered that many of the typefaces in Mac OS X include in their metadata very interesting narratives about their background and history. Just open Font Book and choose Show Font Info from the Preview menu. Arial, Futura, Times New Roman and Trebuchet MS are a few examples. 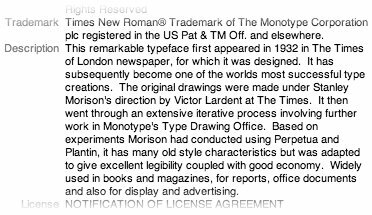 However, you would have hoped that Monotype know better than to put two spaces after their full stops.